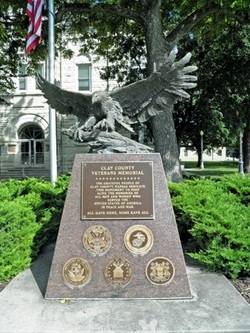 Granite monument with eagle sculpture entitled “Above it All,” by sculptress Sandy Scott. The grateful people of Clay County, Kansas dedicate this monument to keep alive the memories of all men and women who served the United States of America in peace and war. Dedicated Sept. 27, 1997. Erected 1997 by the People of Clay County. All Gave Some, Some Gave All. 712 Fifth Street, Clay Center, Kansas. Actual tank preserved in honor of all 20th Century military veterans. Weight, 52 tons. Crew, 4 men. Engine, VV12 diesel 750 horsepower. Fuel cap, 385 gallons. Cruising range, 310 miles. Average speed, 35 m.p.h. In 1963, cost $235,000. Armament, 105mm main gun; M85 50-caliber M219 7.62 machine gun. Donated by Co. C, 2nd Battalion, 635th Armor, 69th Infantry, KS Army National Guard April 25, 1991. 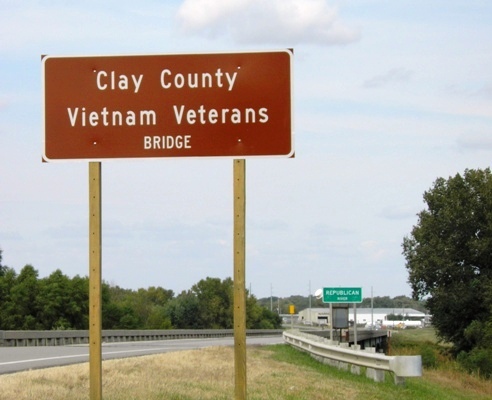 In the fall of 2015, the new Kansas State Highway 15 bridge over the Republican River at the southern end of Clay Center, was dedicated in honor of veterans of the Vietnam War.